Olentangy’s Grace Pennington (11) drives to the bucket against Liberty’s Gina Santangelo (12) during the second half of Tuesday’s OCC showdown in Lewis Center. Senior Molly Delaney scored nine of her game-high 17 points in the third quarter, including the three-pointer that gave host Olentangy the lead for good in a 47-38 victory over rival Olentangy Liberty. 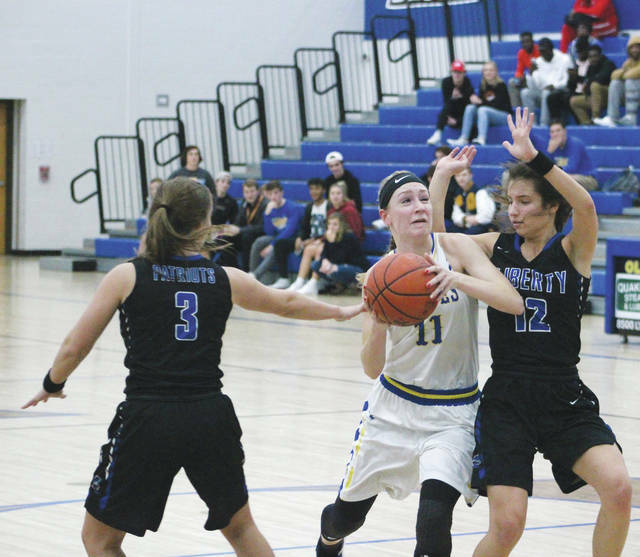 Grace Pennington scored 14 points and Jessica Nation added 11 in Olentangy’s OCC-Capital opener Tuesday night in Lewis Center. Liberty was left looking for answers after sophomore Teegan Pifher left the game at the 2:50 mark of the first quarter with an apparent knee injury. Gina Santangelo provided a spark off the bench for the Patriots by knocking down a three-pointer and a jumper to give Liberty its first lead with 0:20 left before the break at 21-20. The lead made it through the break, but Delaney came through early in the third quarter with a three-pointer at the 7:15 mark to give Olentangy (3-2, 1-0) the lead for good. She added a three-point later in the frame to push the lead to six. Kelly Levering caught fire for Liberty. She knocked down four threes in the second half to finish with a team-high 16 points. After one of Levering’s threes cut Olentangy’s lead to two, Delaney came through with a three-pointer to push the lead to 35-28 at the end of the third. Levering’s fourth three of the half cut the Liberty deficit to two again in the fourth. But, Pennington drove the lane for a lay-in and completed the three-point play at the line to give Olentangy a 39-34 lead. Olentangy closed on a 7-0 run after a Kennedy Kashmiry three-pointer cut it to 41-37 with about four minutes left. Kashmiry finished with seven points and Santangelo added five off the bench for Liberty (2-1, 0-1), which finished with seven three-pointers for the game. Both teams are back at it in league play Friday. Liberty hosts rival Olentangy Orange and Olentangy hosts Westerville South. Both are scheduled for a 7:30 p.m. tip. Follow Michael Rich on Twitter @mrichnotwealthy or contact him on Twitter at mrichnotwealthy@gmail.com.